Now that summer is here, there is even more of a reason to get outside with your dog. One way to get some exercise and enjoy nature with your furry friend is to go hiking. Hiking is a great way to burn some calories while also just giving your dog some new sights to see and something new to do. There are tons of places and trails that you can hike, and you can try something new all the time! While hiking is such a great activity there are some things you should keep in mind before hitting the trail. Here are some of our tips for keeping your dog safe and happy on your next hike! There is some general etiquette that every dog owner should keep in mind on their hikes. You are in charge of your dog and therefore are responsible for what they do. Keep them close to you and in control. If your dog is well-trained enough to be off leash (and the area allows it) still keep them in eyesight. When you see a hiker on the trail without a dog, give them the right of way. Have your dog sit if it is a tight trail and keep them on a leash while the other hikers pass. Say hello to people that pass, as some people may be nervous around dogs. This will make you and your pup more approachable and put that person at ease. Be sure you are always picking up after your dog. Even though you are in the wild, you should not be leaving their waste. Either dig a hole of at least 6 inches and bury it, or just take it out and throw it away when you leave the trail. One way to avoid having any issues on the trail is to only have one dog per person. When you only are hiking with two dogs, it can be hard to control them and issues may arise. Additionally, try not to have more than 2 dogs in a group. When you have three or more dogs, it can be overwhelming or can make other walkers on the trail uncomfortable. One thing to remember about keeping your dog safe is to make sure they’re getting water. Generally dogs shouldn’t drink water from the trail you’re on, since this can cause illnesses, but obviously that is hard. Try to only encourage your dog to drink from clear, running water. Bring your own water and a dish for them to make sure they’re staying hydrated. To stay safe near any cliffs, be sure you have your dog on a leash. You don’t want them to get overly excited and not realize they’re at an edge. There are many things you should bring on your hike with your pup. The more intense or longer the walk, the more you need to plan and prepare. Be sure your dog has a snug collar on with all your contact information. Also be sure you have a short leash for your dog, preferably under 10 feet. Many parks require this, but it is also best for safety. If you’re going to a rough trail or your pup has sensitive paws, bring booties for their paws. Your also want to bring plastic bags to clean up after your pup, as well as a first-aid kit in case something happens to your dog. Bring water, treats, food, and a dish to give your four-legged friend water. You want to make sure dog has the right nutrients to sustain the hike. 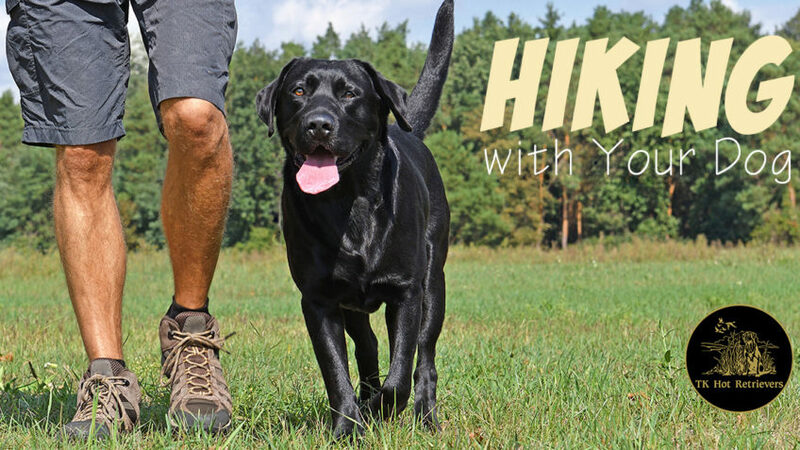 Hopefully these tips help you and your dog have a more enjoyable and safe hike. Good luck!